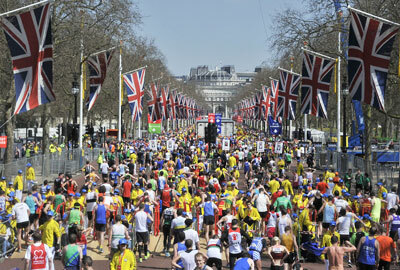 The blood cancer charity Anthony Nolan has been chosen as the official charity partner for the 2014 London Marathon. The charity hopes to raise about £1m through the partnership. It typically fields about 200 runners in the race but will have 800 reserved places in next year’s marathon as a result of the partnership. The announcement coincides with the 40th anniversary of the charity’s formation. Breast Cancer Care and Prostate Cancer UK, the 2012 partners of the London Marathon, raised £1.25m between them during last year’s race. The final fundraising totals for this year’s charities, Age UK and YouthNet, are not yet known, a spokeswoman for Age UK said. Anthony Nolan was chosen as the official partner for next year’s race by means of a vote by staff at Virgin Money, the race’s official sponsor. A spokeswoman at Virgin Money, which would not reveal the two other charities shortlisted for 2014, said representatives from all three charities made presentations to the company’s 2,500 staff to try to win their votes. The company said applicants to be a charity partner had to put forward a specific project they would fund and demonstrate how they would make the most of their opportunity. Anthony Nolan said it hoped to use the money it raises to recruit up to 10,000 new bone marrow or blood stem cell donors to its register – in particular, men aged between 16 and 30. The charity said it costs up to £100 to recruit each new donor. "The money raised through this partnership will have a lasting impact on the lives of people with blood cancer," said Henny Braund, chief executive of Anthony Nolan. "Currently, we can find a match for only half of those who come to us in desperate need of a lifesaving transplant. In order to make more matches and save more lives, we need to increase the numbers on our register of donors."